Brides Of Blood, starring former American teen heartthrob John Ashley and a bevy of naked virgin beauties being sacrificed to a green oozing monster, must have been the heady cocktail of sleaze and tropical breeze that caught the imagination of the drive-in audience; Brides... would be rerun a number of times and create enough buzz for directors Eddie Romero, Gerry de Leon and producer Kane Lynn to return to Blood Island to make a pseudo-sequel, this time with more sleaze, more ooze, more salsa on the enchilada. 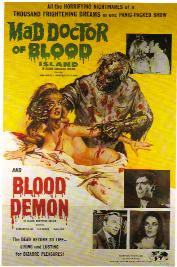 The result was Mad Doctor Of Blood Island, and Hemisphere Pictures had an even bigger hit. John Ashley is back as Dr Bill Foster, investigating the outrageous claim that some of the inhabitants have green blood. Along for the ride is notorious 60s sexploitation star Angelique Pettyjohn as Sheila Willard, looking for her lost father who’s now the island barfly. Ashley stumbles on the ghoulish vivisection antics of Dr Lorca (played by Ronald Remy, who you may remember as the suave bald-headed vampire doctor in The Blood Drinkers); Lorca’s experiments have been turning the locals including his own wife into crusty green-skinned chlorophyll freaks craving blood - and more! Mad Doctor Of Blood Island is your quintessential drive-in experience from the late 60s: so much blood, so much flesh, so much cheese, and so many zoom effects it feels like it was filmed in throb-o-vision. Always with an eye for exploitation, Hemisphere filmed a prologue “Oath of the Green Blood”, where movie patrons were instructed to repeat the sacred words and drink from a plastic sachet of green muck that was supposed to be lime syrup, but was in fact a toxic gel that reportedly made publicist Sam Sherman sick for days! "I, a living, breathing creature of the cosmic entity am now ready to enter the realm of those chosen to be allowed to drink of the Mystic Emerald fluids herein offered. I join the Order of Green Blood with an open mind, and through this liquid's powers am now prepared to safely view the unnatural green-blooded ones without fear of contamination." "The music for MAD DOCTOR was composed by Tito Arevalo (whose real name is Eustacio de Leon Ilagan), older brother of co-director Gerardo de Leon. Arevalo was both an actor and composer whose career was as heralded as de Leon's. 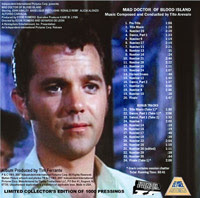 MAD DOCTOR OF BLOOD ISLAND came during the slowing years of his film music assignments, the last of which was Cirio H. Santiago's A TIME FOR DYING (1983). Tito Arevalo is virtually unknown in America, yet many cult film fans know his Blood Island sound. This composition uses unique orchestration that's influenced by the composer's Filipino culture and remains consistent in its tonal environment. So whether it's the deranged Don Ramon on a rampage or a romantic encounter, Arevalo never lets us forget that we're trapped in the jungle landscape of Blood Island. It is horror film music as never heard before. "The events that lead to this original soundtrack CD began four decades ago when 23-year-old Samuel M. Sherman met with a gentleman by the name of Irwin Pizor in the latter's Hemisphere Pictures' Manhattan office. Hemisphere Pictures was one of countless independent production and distribution companies feeding ozoners and hardtops (film industry lingo for drive-in and traditional movie theatres) with low-budget exploitation fare. "As a result of the meeting, a friendly association had begun and Sherman was introduced to Daniel Q. Kennis and Kane W. Lynn, Pizor's business partners. Kennis was one of the original investors in Hemisphere and Lynn was executive vice president. A third partner, Eddie Romero, was based in Manila and served as vice president of that office. Sherman had plenty to offer the cost-conscious group in that he could write copy (he wrote the one sheet hyperbole above), edit film and create marketing strategies better, faster and cheaper than National Screen Service. He was also tapped into the youth market through his work at Warren Publishing Company (Famous Monsters of Filmland, Eerie and Creepy magazines). Sherman's advice to Hemisphere's owners was simple: Start making horror films! "In March of 1969, Lynn, upon returning from one of his trips to Manila, handed a cardboard box to Sherman. "Don't say I never bring you anything," he joked. Inside were three 1/4-in. 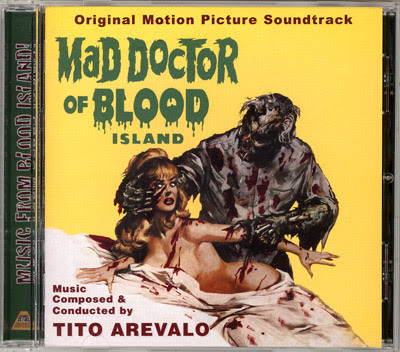 audio tape reels; the master recordings of composer Tito Arevalo's scoring session for the company's newest production, MAD DOCTOR OF BLOOD ISLAND. Sherman liked Arevalo's music from the moment he heard it and went to work writing and producing the film's theatrical trailer and radio and TV spots. 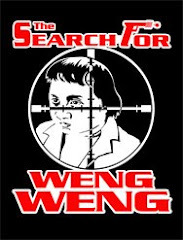 The MAD DOCTOR campaign, aided by the Arevalo's unique sound, proved to be a winner with '60s filmgoers. Thanks to the film's incredible success a sequel, BEAST OF BLOOD, hit theatres in 1970 grossing even more at the boxoffice than its predecessor. Since that time, MAD DOCTOR has been seen worldwide via TV, videotape and now DVD.